← piss piss piss moan moan moan live documentation! 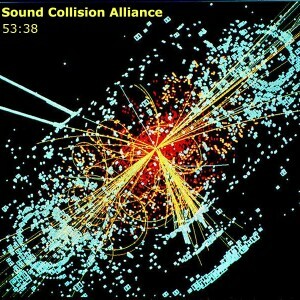 pan y rosas release 53:38 by sound collision alliance! sound collision alliance is a group of three composers who were brought together by their shared interest in exploring the world outside the western classical conservatory style of sound creation. the three composers – darren bartolo, sam krahn, and sarah ritch – rarely discuss melodic or harmonic structure before playing. instead, they use improvisation as a means to investigate the interplay of sound. they experiment with the spatial, harmonic, and chronological elements of sound in order to create a forum to experience vibrations and resonance in an uninhibited environment. 53:38 is the first album from sound collision alliance and was recorded in one session over the course of 6 hours. the sounds created range from pure spontaneous noise to repetitive rhythmic grooves. in addition to guitars, cello and laptop you will also hear gu zheng, guitars, cello, and slinky. get it here.